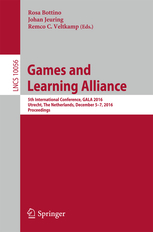 This book constitutes the refereed proceedings of the 7th International Conference on Decision and Game Theory for Security, GameSec 2016, held in New York, NY, USA, in November 2016. The 18 revised full papers presented together with 8 short papers and 5 poster papers were carefully reviewed and selected from 40 submissions. The papers are organized in topical sections on network security; security risks and investments; special track-validating models; decision making for privacy; security games; incentives and cybersecurity mechanisms; and intrusion detection and information limitations in security.